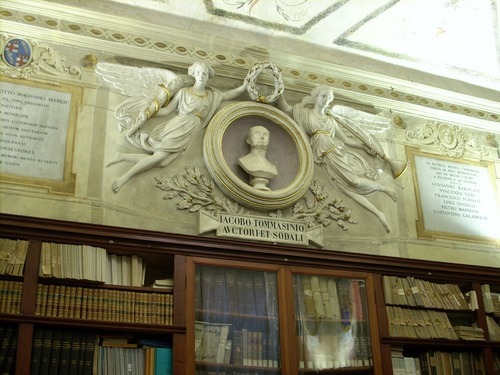 This bust of Giacomo Tommasini, who was President of the Societas Medica Chirurgica Bononiensis from 1830 to 1831, can be seen in a room of the Society named after him, in the Palazzo dell'Archiginnasio, in Bologna (Piazza Galvani, 1). "The work of the sculptor Massimiliano Putti was placed here in 1854. Under the celebratory monument one can see the cartoons containing manuscripts of the lessons that Tommasini held at the University of Bologna"1. 1. S.Arieti, Societas Medica Chirurgica Bononiensis, Clueb, Bologna 2004, plates, p. (8), caption.